Radio service that allows communications between ships, or between ships and coastal stations. 1. A large and unruly crowd of people. 2. Ordinary people; especially, when thought of collectively as unintelligent or irrational. 3. To crowd around someone or something noisily and excitedly. 4. To crowd into and to fill a place. 5. An indiscriminate or loosely associated group of people or things; for example, a mob of boats that are in the harbor. 6. To crowd around and to jostle or to annoy someone; especially, in anger or excessive enthusiasm: "The eager fans mobbed the popular singers." 1. In the workplace where bullying by the boss takes place. 2. A particular type of bullying which is not as apparent as most; such as, an emotional assault. It becomes apparent when a person becomes the object of disrespectful and harmful behavior via innuendo, rumors, and public accusations. Mobbing takes place when someone; such as, a manager, a co-worker, or a subordinate gets others to participate in systematic and frequent "mob-like" behaviors toward the victim. 1. Moving or capable of moving readily or easily; especially, to move from place to place. 2. Capable of being moved; not fixed in place or condition; movable. 3. Characterised by an extreme degree of fluidity; moving or flowing with great freedom; such as, benzine and mercury are mobile liquids as opposed to viscous, viscoidal, or oily. 4. Capable of being moved, aroused, or excited; for example, capable of spontaneous movement. 5. A piece of sculpture having delicately balanced units constructed of rods and sheets of metal or other material suspended in midair by wires or twines so that the individual parts can move independently, as when pushed by a breeze. Movable public; the unstable, fickle crowd. The mob, the fickle or excited crowd; a phrase that recognizes the inconstancy of popular taste and the ease with which clever politicians can influence the great mass of voters. 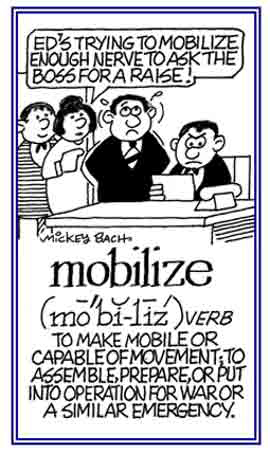 The English word mob is a contraction of this Latin phrase. To activate, assemble for action, or to put into motion: The leader of Mike's country may have to mobilize his military forces to defend against a possible attack by another nation. © ALL rights are reserved. A collector of motor cars. The soft, mobile, posterior (back) one third of the palate which is the inside upper part of the mouth where the front is the harder part or the hard palate, and where the back or softer part is the soft palate. It is attached anteriorly to the posterior margin of the hard palate and laterally to the pharyngeal wall, and it extends backwards and downwards into and between the nasal and oral parts of the pharynx or the passage to the stomach and lungs; in the front part of the neck below the chin and above the collarbone. Showing page 2 out of 2 pages of 30 main-word entries or main-word-entry groups.